SpaceObs, website run by Leonid Elenin, the most mysterious amateur astronomer that discovered Comet C/2010 X1 or Comet Elenin. Elenin was visible on STEREO A HI1 from September 6th to the 22nd where it then moves out of the field of view. To see it you need to play the frames very quickly and look for a fast moving barely visible fuzz ball moving on the center of the frame from right to left. So, though we could not see it on SOHO, it was still definitely visible to STEREO A HI1. Since September 23, the comet Elenin may be visible in the field of view of spacecoronagraph C3, installed on the spacecraft SOHO. 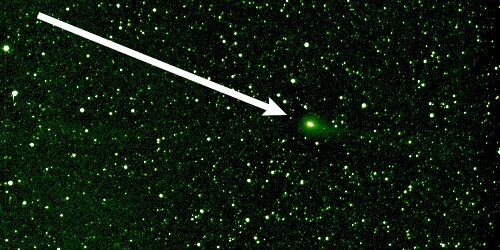 As comet disintegrated or still disintegrating, there is a strong chance that we did not see anything or see it, but only after post processing of the original images. On images comet will move from left to right, ”under” the Sun. It may be seen as a fuzzy, hardly visible cloud. This is the statement of Leonid Elenin on his website dated to September 26, 2011. This entry was posted on September 30, 2011 at 7:04 PM	and is filed under Anomalic Interferences. Tagged: C/2010 X1, Comet, earth, Elenin, Jet Propulsion Laboratory, nasa, Nicolas Cage, STEREO. You can follow any responses to this entry through the RSS 2.0 feed. Responses are currently closed, but you can trackback from your own site.